Spring Athletics Registration will open on February 11th. Modified practices can start on March 11th. 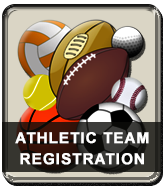 - Middle School Students MUST Register for Modified sports. Click HERE to see information about the first day of practice for each sport. We will close registration at the start of practices. There is a REQUIRED NYS HEALTH EXAMINATION FORM that must be used for all sports physicals. This form can be downloaded from the link in the main menu above. ​Athletes must have a current sports qualifying physical exam on file in the Nurses Office. Physicals are good for 1 year up to the last day of the month. To ensure clearance for participation, physicals should be uploaded or on record with the School Nurse. Once received Final Clearance will be set for participation. As per NYSPHSAA Bylaws & Eligibilty Standards: "If the 12-month period for the physical expires during a sports season, participants may complete the season as long as 'the interval' health history was conducted prior to the season"
​For example, a physical conducted on August 1 would be valid through August 31. If a student plays beyond August (ex. football), the student may complete that sports season as long as an interval health history was conducted before the start of the season. Immediately following the last sanctioned tournament competition for that season, a n e w physical i s required if the student is going to play another sport. Sport season includes tryouts. If you have questions or need assistance with the registration, please contact.